Home » 2010 Minutes » Long Time MARFC Member Passes! On behalf of all of us here at the Michigan Automobile Racing Fan Club we are very saddened to hear about the passing of one of our longtime members and friend Ed VanDuinen. Ed and his wife Carmen were the longtime owners and promoters of the Merritt Speedway as well as the Michigan Modified Association. He was one of the very first members of the Michigan Speedways Promoters Association and had just taken the time off the last couple of years from promoting to enjoy his retirement. During my tenure as President of MARFC Ed was one of the first promoters to come up to me and ask if there was anything he could do to help me and the club all I needed to do was ask. That was just the kind of friend Ed was. 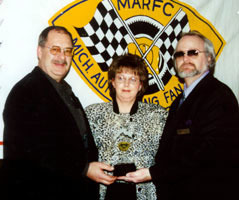 It was my privilege to award Ed and Carmen the 2000 MARFC Promoters of the year at our Annual Banquet back in January of 2001. He was a strong supporter of his champions always attending our Annual MARFC Banquet and you could most always find him telling stories and laughing with many during the banquets. Most time he was one of the very last to leave. Ed was a strong and direct speaking man who made friends with fans, drivers, track workers and others who he meet in our great sport of auto racing. He will truly be missed by all who knew and respected him in the racing community. He and Carmen were just voted into the Michigan Motor Sports Hall of Fame for 2010 and I am sure that during the Awards Banquet in November you will feel his presents in the air as both he and Carmen are formally inducted at that time. Our thoughts and prayers are with Carmen and the entire VanDuinen family at this time. We also are thinking of all the racers and staff ant the Merritt Speedway who were an extended part of his racing family. Donation can be made to the Moddersville Reformed Church.